Starring two-time Academy Award nominee Naomi Watts, Golden Globe nominee Ewan McGregor and newcomer Tom Holland. Directed by J.A. Bayona and based on the harrowing real-life experience of one family during the Indian Ocean tsunami. Arriving on Blu-ray, DVD, Video on Demand and Pay-Per-View April 23 (with an early Digital window beginning April 2) from Summit Entertainment, a LIONSGATE company. A family faces unbelievable odds in the celebrated drama The Impossible , starring two-time Academy Award(R) nominee* Naomi Watts, Golden Globe(R) nominee Ewan McGregor (Salmon Fishing in the Yemen) and newcomer Tom Holland. Directed by J.A. Bayona (The Orphanage) and based on the harrowing real-life experience of one family during the Indian Ocean tsunami, the film arrives on Blu-ray Disc (plus Digital Copy and Ultraviolet), DVD (plus Digital Copy and Ultraviolet), Video On Demand and Pay-Per-View April 23 from Summit Entertainment, a LIONSGATE company. The Impossible will also be available on EST April 2, three weeks prior to the Blu-ray, DVD and Video on Demand release. Garnering Academy Award(R), Golden Globe(R) Award, Broadcast Film Critics Award(R) and Screen Actors Guild Award(R) nominations for her powerful performance, Watts portrays Maria, a mother fighting to reunite her family after one of the largest disasters in recent history. Tom Holland, in his astonishing film debut, also earned a Broadcast Film Critics Award(R) for his performance in the daring drama as her eldest son. The Impossible Blu-ray and DVD bonus features include deleted scenes, two behind-the-scenes featurettes and an audio commentary with the director, writer and producers of the film along with Maria Belon, the woman whose family experience is the story on which the film is based. A public service announcement (PSA) from the Happy Hearts Fund is also included on the Blu-ray and DVD. The Happy Hearts Fund is a non-profit foundation dedicated to rebuilding schools and restoring hope and opportunity in the lives of children after natural disasters. 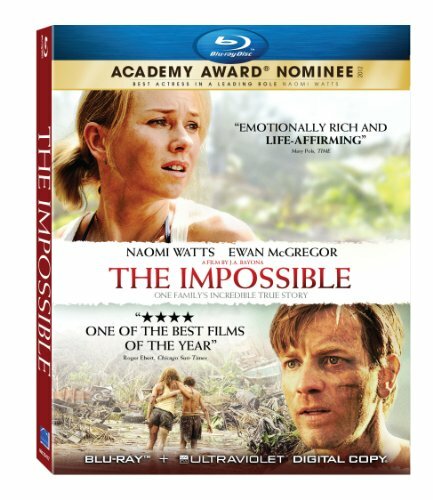 The Impossible Blu-ray and DVD and will be available for the suggested retail price of $39.99 and $29.95, respectively. The Impossible is the unforgettable account of a family caught with tens of thousands of strangers in the mayhem of one of the worst natural catastrophes of our time. But the true-life terror is tempered by the unexpected displays of compassion, courage and simple kindness that Maria (Watts) and her family encounter during the darkest hours of their lives. Both epic and intimate, devastating and uplifting, The Impossible is a journey to the core of the human heart. Title Copyright: The Impossible (c) 2012 Telecinco Cinema, S.A.U. and Apaches Entertainment, S.L. Artwork & Supplementary Materials (c) 2013 Summit Entertainment, LLC. All Rights Reserved.